A Croydon, United Kingdom-based Nigerian woman has launched a taxi firm where all of the drivers and most of the passengers are women and children only. A British-Nigerian woman identified as Sade Agboola has set up a women-only drivers taxi company in London. The single mother of one started the innovative means of daily commuting to offer women a safe and reliable alternative to minicab services and public transport in London. 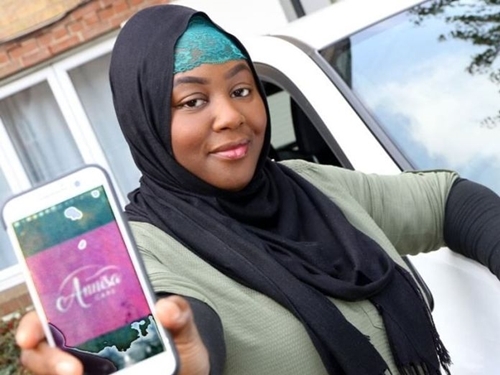 Agboola’s company, Annisa car, which will only be accepting women and children as passengers, will commence operations within the South of London with plans to extend its services across other parts of the city of London in due course. The entreprenuer’s idea of public commuting is coming at a time when Uber, the popular ride-hailing mobile-technology-enabled cab service, faces serious challenges in London. Transport for London (TFL), the entity that regulates all transport activities in London, banned Uber in October from operating within the city citing the company’s ineffectual approach to reporting criminal offences and its way of carrying out background checks on drivers. Though Uber has appealed the TFL’s decision in court which is yet to deliver a ruling, the emergence of services like Agboola’s Annisa car that promises better security and safety presents another headache for Uber in London. Agboola was expectedly ecstatic as she shared her thoughts on the birth of the enterprise and the value that is on offer. “It is quite entrepreneurial but I never thought about it like that, I had the idea a couple of years ago and since December 2016 I’ve been doing a lot of research and work to put it together. Meanwhile the business has already been attracting considerable patronage with some of the passengers already leaving positive reviews on the new taxi company’s website for excellent service delivery.